I've Spent 12 Years Surrounded by Hollywood Peen. Where Are the Women Directors? Here's a fun game: name five of your favorite directors. Now name five prominent male directors who released movies in the past year. Now name five female directors of…ever. I am a professional actress who, at 21, has worked in Hollywood for the past 12 years, and I can count on one hand the females I've worked under. Something is very wrong with this picture. For the past four seasons, I've starred on an ABC show called The Middle, otherwise known as "Not Malcolm in the Middle—we're on the same night as Modern Family." During this time, I've lived in a happy, beautiful bubble of gender equality. Five out of the show's nine writers are women. The Unit Production Manager (an important on-set producer) is a woman. Television shows tend to rotate through directors, and 60% of ours have been women. The cast also includes two strong female leads (Patricia Heaton and, well, me) whose characters pass the Bechdel test week after week. And most importantly, The Middle was created by two women, Eileen Heisler and DeAnn Heline, who are still running the show. This is not the norm. Having women steer the ship makes all the difference in the world. For example, I worked on a show in 2006 (another sitcom for ABC) that was created and run by men. There were only two female staff writers. All the producers were male. Every director, too. But despite the bro-heavy environment, these guys were not bad or misogynistic — in fact, they were awesome, progressive and kind. And yet nary a woman in sight. So what was the problem? Why did this show reek of peen? It wasn't because of some deep-seated aversion to women in the workplace. Rather, the problem was that these guys seemed to only hire people who were exactly like them: guys. And while working with what's comfortable and familiar is all well and good, if your goal is to create an honest story about men and women interacting with one another — as was the aim of this particular show — you're definitely going to miss the mark if you don't have any input from a real, live female. The show was canceled after twelve episodes. At this point, the question should be obvious: Where the ladies at? 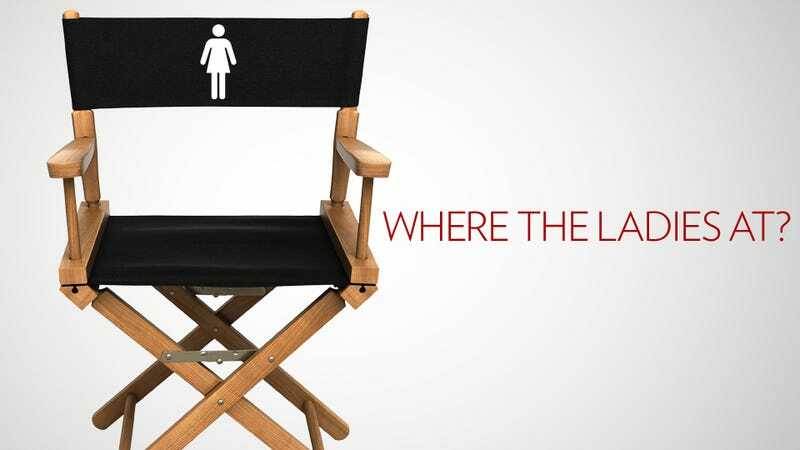 Why aren't more women in positions of power in the film and television industries? * I know lots of smart, capable women with hopes of working as actresses, but almost none who want to be directors. In fact, when I ask these smart, capable women actress friends if they've ever considered directing, the response is invariably along the lines of, "Directing? I don't think I could handle that." These are not women who are typically meek or lacking in confidence, but for some reason they consider themselves ill-equipped to be in charge. I was shocked when my one friend bursting with energy told me explicitly, "I'm terrible at telling people what to do. I could never do it. Just seems like a lot of confrontation." Over and over I found that they all have the desire to be creative and get involved in some way behind the camera (they all "would love to write something some day, y'know, maybe help produce or something"), but are eager to forfeit the position of The Boss. Amongst young women, I sense an almost pervasive aversion to directing. It's unsettling. Why are so, so many of my talented girlfriends uninterested in taking charge and sitting in the directors chair? Should we be pointing fingers at a phallocratic society? The patriarchy? The elusive Hollywood Boys' Club? Should we be talking about a glass ceiling? Meanwhile, when I ask my male friends (those who wish to be involved in television or movies in some capacity) the same question, nearly all of them have directing as goal number one, or at least include directing as something they'd love to try eventually. Before 1983, directing was a near-impossible dream for women; at the time, women accounted for .05% of the working directors in TV and film. But in 1983, the DGA's Women's Steering Committee sued Warner Bros. and Columbia pictures for discrimination, and though the lawsuit was eventually thrown out, this legal action put a serious flame under studios' asses to start diversifying their employees. I spoke with Lee Shallat Chemel, who has directed the majority of The Middle's episodes, about her experience breaking into television thirty-something years ago. She came to LA at exactly the right time — she was desperate to direct and studios were desperate to hire her— but while it was easy to get the job, it wasn't so easy on the job. As is the case when any professional woman breaks into the boys' club, Chemel felt her presence was not welcomed. If directing in general was difficult for females to break into, the world of comedy TV was Fort Knox. Television production is fast-paced and high-pressure; male producers in the 1980s didn't believe a woman could handle the do-or-die environment. These skeptical men set their standards twice as high for women; leeway for mistakes was nonexistent. Any trace of femininity was not tolerated, Chemel told me. After all, working with a woman was bad enough — a woman who actually acted like a woman was intolerable. Any sign of emotion? She must be on her period. Not aggressive enough? Fired. Too giggly? Buh-bye. One time, Chemel felt she wasn't really clicking with a main actor, so she took him aside to ask him what the problem was. He told her outright "I don't like being told what to do by a woman." After relentlessly working to proving herself, Chemel finally began to earn people's respect. Thirty years later, she assured me, progress has been made and things have changed for the better. The same old Absolutely No Room For Mistakes principle still applies to newcomers — if a professional woman is an unknown or untested quantity in the director's chair, she runs the risk of getting labeled "emotional" or "crazy" — but for the most part, people's attitudes on set have largely improved (notoriously dude-heavy writers' rooms notwithstanding). It's no longer hip or accepted to be outwardly misogynistic. So when I told Lee that so many of my girlfriends have no interest in directing, she was as confused as I was. We both had to question why. Why, thirty years and some damn hard work from determined women later, are the numbers of female directors still disturbingly low? If you've not already gathered, I want to direct. And I have; last spring I wrote and directed my first short film, The Suitcase (coming soon to a computer screen near you). And you'll never guess what happened. Everything went off without a hitch and happened exactly as I had expected! I got to set and was the fearless lady boss I had always dreamed of being! Right? Wrong. I was neither fearless nor powerful. The first day of shooting, my mannerisms undermined my authority. I was directing, technically, but every order I gave came with an apology: to my director of photography when I wanted him to reshoot something, to my lead actress any time I wanted her to slightly tweak her performance, even to my sound guy when he accidentally stuck his boom mic in the shot ("I'm sorry to ask you to fix this big mistake…"). I had turned into this fearful, powerless, shrunken speck of a human, and it took me fourteen hours to realize how I was behaving. At the end of day one, my lead actress stopped me mid-sentence. "Eden, why are you so afraid to direct right now? You are the director. Direct me." It was a brief but empowering moment. Suddenly, I understood what my job entailed. I had always known exactly what I wanted and how I wanted it done. The problem was that I had not felt comfortable expressing it. Instead, I thought it was more important to make sure every other person on set was happy, that they liked me — even if it meant sacrificing my own vision. Wanting to be liked means tempering your thoughts as to not offend…Wanting to be liked means being a supporting character in your own life, using the cues of the actors around you to determine your next line rather than your own script. It means that your self-worth will always be tied to what someone else thinks about you, forever out of your control. Sounds familiar. There are certain things that women are expected to be: submissive, gentle, unthreatening, refined, delicate little flowers. But these qualities are irreconcilable with being a director, and I believe this is why the ratio of male to female directors is still so skewed. The opportunities still exist, but women's attitudes about themselves — at least in Hollywood, in my experience — has largely stayed the same. It isn't just that capable women are being turned away from the job. Capable women aren't even applying for the job. The most important missing factor in ladies directing is ladies believing they can direct at all. My experience directing speaks to this struggle: I know I am the best candidate for the job, but I am afraid to tell other people. While I have never questioned my ability to be the boss, I have issues letting the rest of the world know. I have tons of internal confidence but struggle with the external part. On the inside, I'm a 50-ton bulldozer ready to destroy anything that stands in the way of what I want, but that can't be right — bulldozers are massive and intimidating. Aren't I supposed to be a dainty little princess patiently awaiting my knight in shining armor? A bulldozer looks nothing like a delicate flower! If I don't act as I "should," if I say anything contrary to what anyone else thinks, anything that could offend someone else, I'm scared of what might happen. But I can't be a director and be afraid. I'd rather be a director. Being a director is knowing what you want, instructing other people to do it, and making no apologies about it. To be clear, I'm not saying every single girl should want to be the boss, because not every human has the same desire to be in charge. Moreover, directing can be scary as hell. It's a challenge, but shouldn't it be a gender-neutral, equal-opportunity challenge? I don't doubt the existence of tons of young girls who want nothing more than to tell everyone around them what to do and direct their hearts out; they just need endless role models and encouragement. If more girls felt encouraged to rise to the top, if they saw people similar to them in positions of power, if they felt they could belong in an Executive Producer or Director position, maybe they would grow up to be directors hiring (and inspiring) more women. And so on, and so forth. It's an uphill battle. Intentionally or not, movies and television show women how to behave, how to look, how to act. We're inadvertently trained by what we see. The barriers to entry for female directors are more entangled with the institutional pressures of how women are supposed to be than just the fact that gender inequality runs rampant in Hollywood. Without female directors, there aren't as many strong female role models; without strong female role models, there aren't as many female directors. It's not hopeless, but it's definitely not fair. But we need to do it. We need to make the movies we want to make and tell the stories we want to tell. Women make up half the population — it is imperative for girls to understand how awesome they are and how much they are capable of, to not be scared, because sharing ourselves and our points of view is crucial to keeping the world in balance. *There are still women — and these ladies should not be overlooked — but we need more. The ratio is a mess. But for reference, use this as a cheat sheet the next time someone quizzes you about women behind the camera in film and television: Penny Marshall, Deepa Mehta, Sofia Coppola, Nancy Meyers, Lisa Cholodenko, Jill Soloway, Lynn Shelton, Kathryn Bigelow, Debra Granik, Amy Heckerling, Jodie Foster, Mary Harron, Nicole Holofcener, Lena Dunham, Barbra Streisand, Mindy Kaling, Tina Fey, Amy Poehler, Wendey Stanzler, Jamie Babbit and Lee Shallat Chemel, who knows more information on any given topic than any other living human being. Eden Sher currently stars as Sue Heck in ABC's "The Middle." She's also had roles on "Weeds," "Sons and Daughters," and "Party Down." She's just wrapped up post-production on her directorial debut, "The Suitcase," and fully intends to continue calling the shots on future projects.